There just might be a zombie baby showing up in season 4 of The Walking Dead, and this would be something unlike anything else we have yet to see in the AMC television series. 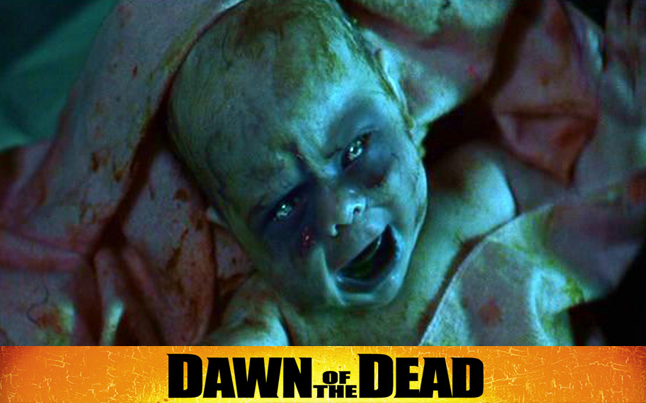 According to Today, Robert Kirkman said that it would be something different from the baby in the Dawn of the Dead, but it would be cool and something different. Now the only infant that we know of so far is Rick’s ( or is it Shane’s???) baby Judith, however the zombie baby is supposedly going to be shown in the premiere…so we can almost count out baby Judith. Then again, you never know what the writers are up to. This so called zombie baby could in fact actually mean something later on down the road in season 4, but this is just mere speculation. Either way, at this point everything is more or less a guess since nothing is really confirmed. We will just have to wait and see what they have up their sleeve when season 4 of The Walking Dead begins October 13th. If by chance, you never actually caught the zombie baby from the Dawn of the Dead, check it out below as there is a small clip. Probably one of the Woodbury ladies. I think I recall the gov or the dr talking about a pregnant lady, I would have to go back and watch. I guess the baby can’t bite because it doesn’t have teeth but any mom will tell you that baby nails are like little razor blades. And if you breastfeed, when they are teething they can gum the crap out of you to where you have to double check that they didn’t break te skin and there aren’t any teeth yet. A zombie baby would be very bitter sweet because I’ve been patiently anticipating one, I was hoping Laurie would have a zombie. On the other hand babies are just so stinking cute that I hate for one to be a zombie. I doubt that there will ever be a zombie baby. How cheesy and ridiculous would it look to have a zombie baby?